In the 2009 Budget Statement presented Monday by Finance Minister Karen Nunez-Tesheria to the parliament of Trinidad and Tobago, the government announced that (surprise! surprise!) it is finally abandoning the Environment Management Authority’s (EMA) ten year-old proposal for a law creating a beverage container deposit-return system, and will instead is opting for a comprehensive waste recovery and recycling strategy. The Government, she said, has decided not to focus on just a single waste stream and instead focus on a general waste recycling system. provide for the creation of a nationwide system of collection depots for recyclables. The Budget Statement announcement was not totally unexpected. Back in March Local Goverment Minister Hazel Manning announced that the Cabinet had approved the outlines of a new solid waste management policy and plan of action that, in addition to revamping the nation’s waste collection and disposal system. Then in June the Government of Nova Scotia announced a very special environmental assistance agreement with Trinidad and Tobago. 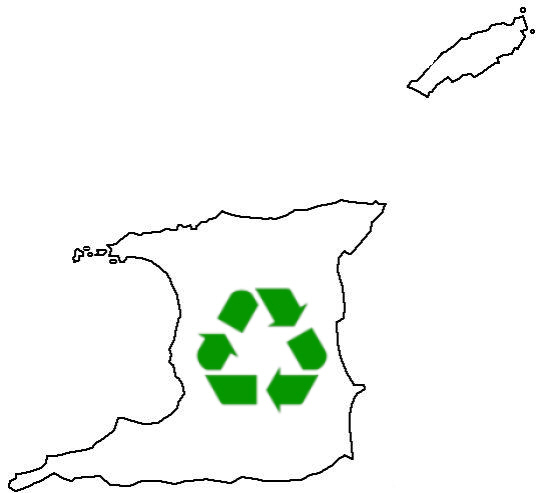 Nova Scotia will work with Trinidad and Tobago on environmental projects by providing advice on legislation, policies, programs and procurement, and by assisting with landfill design and construction, establishing and setting up a recycling depot system, and implementing municipal composting programs. How Closely Will T&T Follow the Nova Scotian Example? This is a very interesting development, particularly if one is familiar with Nova Scotia’s waste regime (as I am). NS’ Environment Act and related waste regulations give the provincial environment minister broad powers to regulate packaging waste through such instruments as recycled content requirements, deposit-return systems, or restrictions on types of packaging that can be marketed, if the minister so choses. Many of these powers are not (yet) exercised. NS requires all beverage containers to be either recyclable or refillable, and has a beverage container deposit-return system covering all beverages except milk, milk products, soy milk or concentrates. Non-alcoholic containers carry a C$0.10 deposit; alcoholic containers up to 500 ml carry a C$0.10 deposit, larger containers C$0.20. Consumers take empty containers to a one of a network of depots to get half their deposit back (deposits are fully refundable only for refillables). There is a separate “voluntary” packaging stewardship agreement for milk packaging negotiated between the Environment Department, the solid waste manegement regions and the dairy industry. 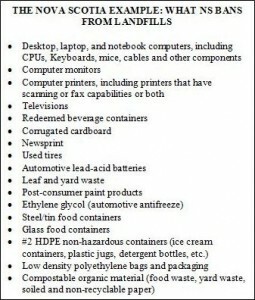 Cartons are included in municipal “blue bag” programs and sorted by the municipalities or their contractors, and the industry pays for recovery. NS also has special recycling, recovery or waste management regimes for waste electronics (a take-back regime managed by industry), paint (a product stewardship program), used oil (a mandatory take-back scheme) and scrap tires (featuring an advance disposal levy). The beverage, paint and tire regimes are overseen by an autonomous Resource Recovery Fund Board (RRFB). Items covered by the regimes are banned from entering NS landfills (as are many other things — see box). NS practices curbside recycling pick-up. Compostable organic material also is collected from a majority of households and composted at central composting facilities. I wonder how many of these features will find their way into T&T’s legislative and regulatory proposals?